DPS Troopers Micholak (left) and Bass investigate. 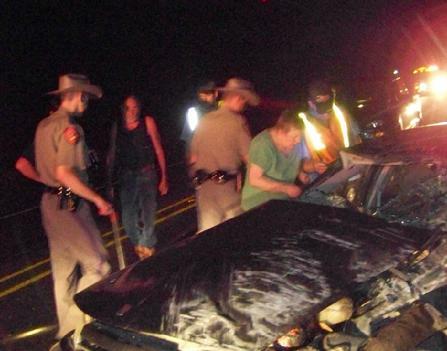 Single Vehicle Accident Near Polk County Line Gets Lady Life-Flighted From Onalaska, SAN JACINTO COUNTY, June 29, 2008 - Shortly after 2am on June 29, 2008, a blue 2002 Saturn L100 sedan driven by Cathryn Berry, 30, of San Jacinto County, was west bound on 190 and had just crossed the Polk County line when her car veered off the road to the right and into a lawn. The car proceeded through the grass and hit a culvert and went airborne turning in the air, when the car landed it rolled over, skidded upside down and then landed upright facing east on 190. Berry was ejected from the car during the roll over and landed behind the vehicle on the road. Both of the car's airbags deployed. The first emergency responder to arrive on the scene was Onalaska Policeman, Anthony Yaw. Also at the scene were firemen from the Point Blank Volunteer Fire Department, Polk County Sheriff Deputy, Jason Thomas, and Lloyd Spencer of the San Jacinto County Sheriff's Dept. An ambulance from Americare Ambulance Service was at the scene and treating Berry before they transported her to the Life Flight helipad next to the Onalaska Volunteer Fire Department. DPS Troopers Thomas Michalak and Ramey Bass were dispatched to the scene of the accident. Later, Berry's mother arrived at the scene and gathered some of her daughter's belongings from the scene of the accident and answered some questions for the troopers. Debris including shoes, cd's, bottled water, blankets, and all sorts of car parts formed a debris field around the scene of the accident. The west-bound lane of traffic was blocked as emergency personnel worked the scene. The troopers wrapped up their work at the scene and the car was towed away by a rollback wrecker from Britrim wrecker service. The scene was cleared up by around 4:30 am.